From business to Ladybits. Arikia Millikan‘s talk has a provocative title – is the gender imbalance in the tech world damning the human race? Arikia is the only speaker in the line-up to tackle this issue head on. This is a good question to ask in Kosovo given the large absence of women from the tech field. 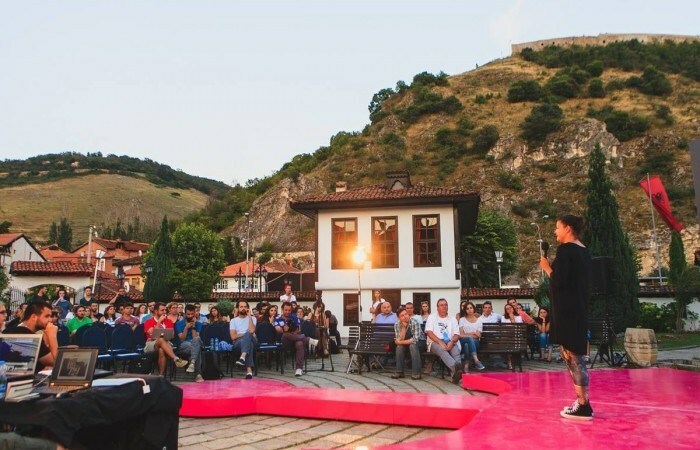 Kosovo is not alone in addressing this challenge – check out the findings from the release of the diversity reports from 10 companies in Silicon Valley. Will be great to hear the questions from the audience and in particular the Girls Coding Kosova crew. They have made great strides this year to encourage more women to choose tech related professions, improve their coding skills, start their own companies and support each other in their efforts. At DOKU:TECH 2015 tonight what is the % of women in the audience? (The answer is 48% – almost at the 49.7% in the population in Kosovo). aside half the workforce by leaving out women? We won’t get to the future that we have talked about at DOKU:TECH without women. She shared the analogy of drawing a trump hand in cards. White, male, healthy from a wealthy family. Her own hand of cards – female, minority, born in US, smart. The only thing we can do in life is play our hand of cards. attractive to women. This wasn’t of interest – they said their demographic were 30 year old men. Women don’t read Wired so she left to start Ladybits – first on Medium then Popular Science then Refinery29 and now to Vice – Motherboard. So why should we care? Studies show that productivity reaches its peak when gender balance reaches 50/50. What can we do about it? Form partnerships to get content out there like they did with Ladybits. Turn objectification on its head by showing how images of women portray them in traditional roles. Identify barriers to women to enter the workforce. Finding spaces to share our thoughts and strengths. A good challenge to the Girls Coding Kosova team. If you’d like to find them – FB page – FB group – Twitter @girlscodingks – a great blog post.